On National Sewing Machine Day we honor the invention of the humble sewing machine and how this little invention has changed our lives for the better. Join us in a look back at BERNINA sewing machine history, and enter for your chance to win our popular BERNINA Retro Bag; our Sewing Machine Day gift to one lucky WeAllSew reader! BERNINA is a fourth generation family-owned business that has been manufacturing machines in Steckborn, Switzerland for over 120 years. Here are some of our favorite BERNINA sewing machine milestones! 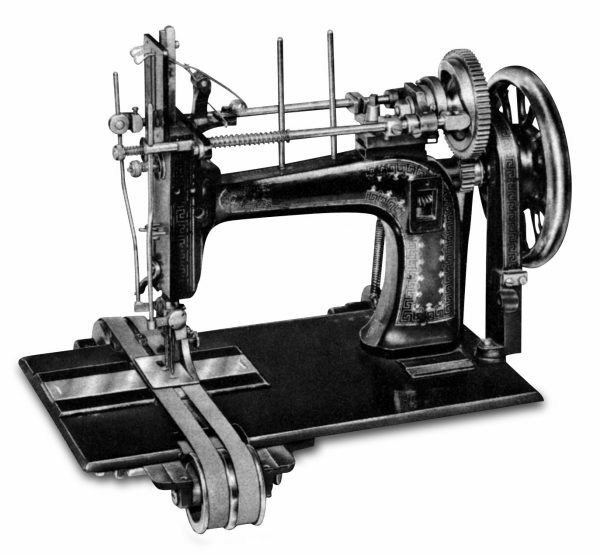 In 1893, Karl Friedrich Gegauf invents the hemstitch sewing machine. This machine can sew 100 stitches per minute. It was the world’s first machine of this type, and also caused a major sensation abroad. The mechanical production of hemstitching was subsequently known simply as “gegaufing.” By 1900, 70 to 80 people were employed in the workshop; it had become a small factory. Karl Friedrich Gegauf was the technical director. His brother Georg was in charge of the business interests. The hemstitch sewing machine had found widespread use and was also being sold abroad. After the death of Karl Friedrich Gegauf in 1928, his two sons Fritz and Gustav Gegauf took over their father’s factory. Gustav Gegauf left the company in 1947. Fritz Gegauf was a creative person whose character defined the company for many decades and whose inventions have an effect to this day. 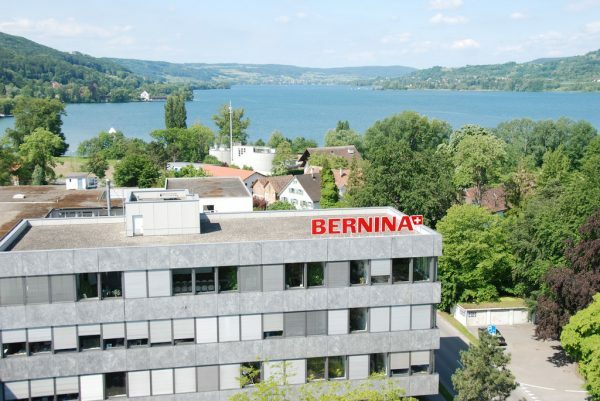 In 1932 the household sewing machine with the BERNINA brand name leaves the factory in Steckborn. The logo contains a rounded “A” and is set off by a background of shiny black lacquer. The company’s namesake is the Piz Bernina, the highest summit in the eastern Alps. In 1945 the first portable zigzag sewing machine appears in 1945. As demand developed, production numbers rose steadily upward: By 1963, BERNINA had produced one million zigzag sewing machines. 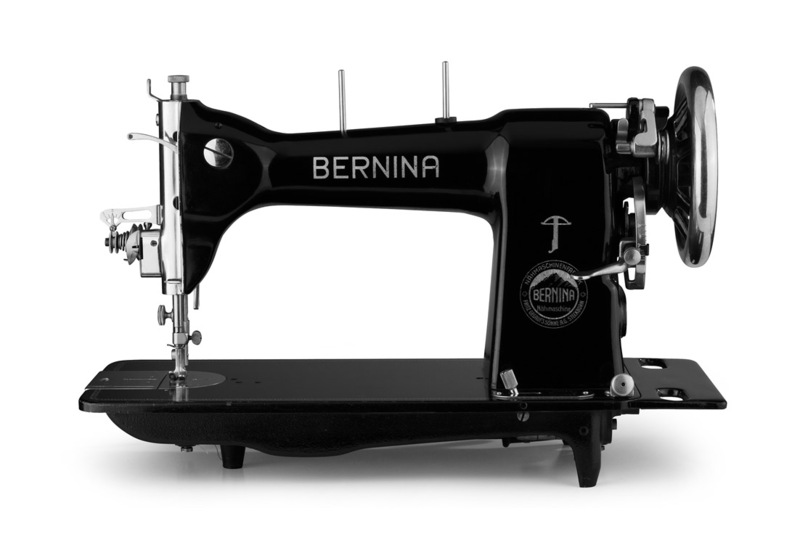 In 1963, BERNINA introduces the first machine with a patented, knee-activated presser foot lifter. The Free Hand System (FHS), which not only raises the presser foot, but also lowers the feed dog, is still an important feature of almost every BERNINA. A sewing machine with electric foot control, the BERNINA 830, follows in 1971. This machine establishes itself as a top model in the 70s, remains the best seller for eleven years and enjoys legendary status today. In the mid-80s, BERNINA produced the 1130, the first computerized sewing machine with fully automatic one-step buttonholing and stitch pattern memory. In 1998 BERNINA introduces the first sewing computer, the artista 180. The company has finally entered the computer age. The world’s first sewing computer with a Microsoft Windows operating system enters the market in 2002. 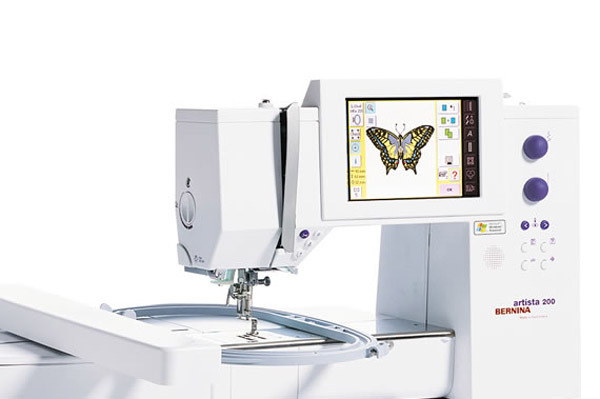 Other features include CD-ROM drive, LCD display and memory functions for stitch combinations and embroidery designs. The BERNINA 830 introduced in 2009 is a machine of superlatives—the biggest and fastest machine ever produced at a BERNINA factory. For this product alone, 15 patent applications were filed. The Swiss precision of the B 830 guarantees an unforgettable sewing and embroidery experience. BERNINA has been known for its tradition of innovation and quality, and continues to bring new ideas to our latest products. 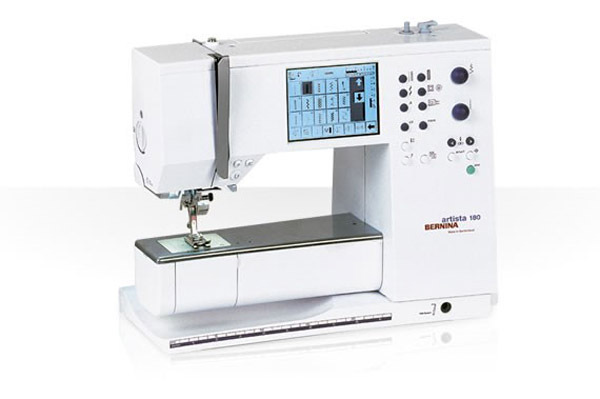 In the year 2012 BERNINA introduces the 7 Series machine with extended sewing space for sewing, quilting and embroidering. 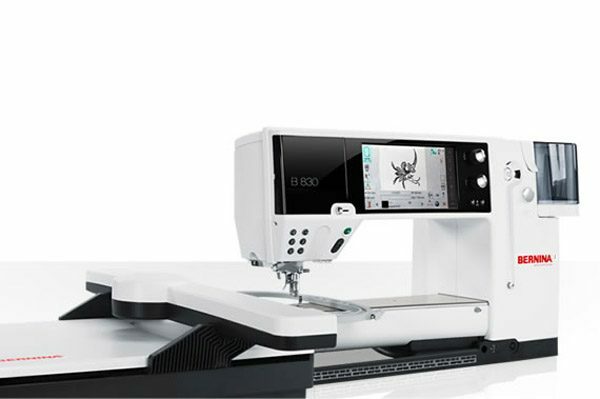 The B 790 exemplifies the ideal for sewing and embroidering with the 7 Series machines, offering the extended free arm for more sewing and embroidering space, the BERNINA Stitch Regulator, Dual Feed, Stitch Designer and on-screen embroidery controls. The 7 Series presents a world’s first, the B 9 Hook system, combining the two best hook technologies with a larger capacity bobbin. 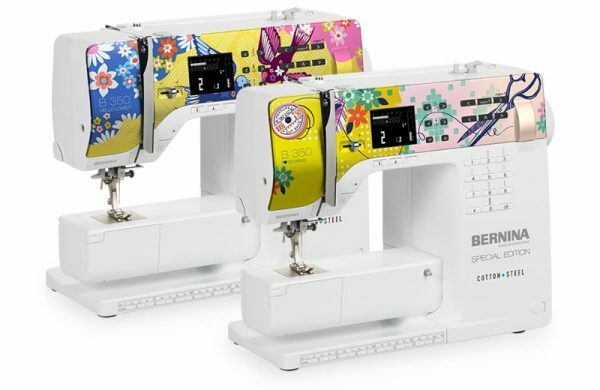 This spring, BERNINA introduced the new BERNINA 350 SE COTTON+STEEL sewing machines! 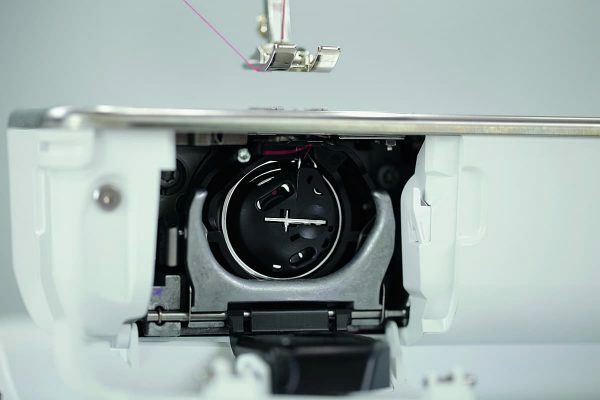 The BERNINA and Cotton+Steel B 350 Special Edition machines include standard accessories like the Free Hand System (FHS), the quilting foot, full shank presser feet. The two amazing Cotton+Steel faceplate designs are named Hello Lovely! and I ❤ Sewing! The B 350 SE is great for quilters and sewists alike. And when your interests and skills grow, the B 350 SE easily upgrades with lots of optional accessories. 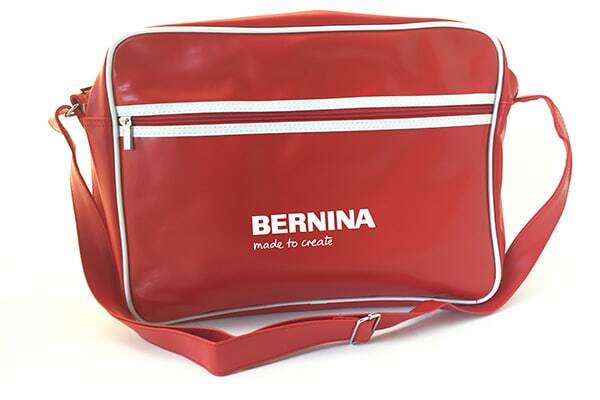 Win a BERNINA Retro Bag! Do you remember your first sewing machine? A winner will be drawn from the comments on Thursday, June 15, 2017 and announced about a week after the contest is closed! The giveaway is open to residents of the 50 United States and the District of Columbia. One comment per fan. Comment must be submitted to the WeAllSew.com blog by June 15, 11.59 p.m. Central Time. Winner will be chosen randomly. Winner will be notified by email and will have 48 hours to contact to claim the prize. 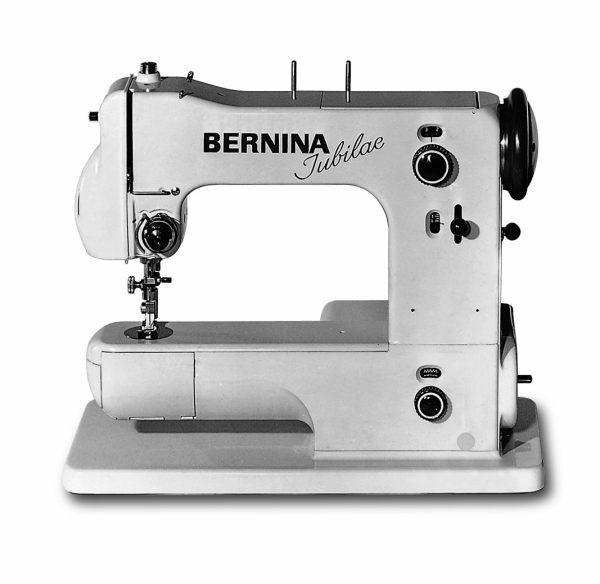 My first sewing machine was purchased at the International Quilt Show in Houston 21 years ago — it was a Bernina 1090, which I still own! One year ago I updated to a Bernina 560, but my 1090 is still chugging along and is my backup machine. It’s the machine I let my husband use, instead of my fancy 560! Bernina has done me well over the decades. I am new to the sewing/quilting world. Bernina was the first machine I sat in front of. It only took approx 30 seconds for me to know I’ve found my home. No need to look any further. Started with a 330, just a few weeks later went to a 530 and within 6months. I jumped to the 770qe. Call me goldielocks.. because the 770qe is “just right”. Thank you for a trip through history, very interesting!!!! My first sewing machine was a Bernina 730 (the old model from I believe the 60’s) purchased used from a friend who was upgrading to a newer Bernina. I have since owned an 830 (from the 70’s), a 180, a 730 (newer model), and now I use a Bernina 780. I also own a Bernina 153 as my backup machine Wonderful machines! 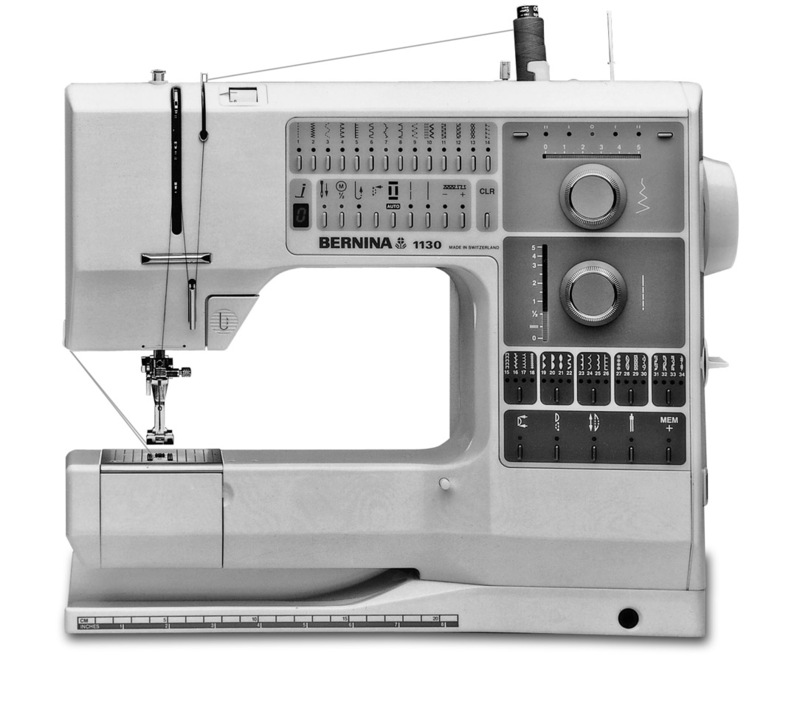 The first machine I used was My mother’s 830 Bernina, My first machine was and still is my Bernina 1230….which I love! My first machine was one my mother-in-law gave me because she never used hers – it was a Singer (same as the one my mother had when I was little). When I was in my 20s I started getting into the embroidery and purchased a used bother machine. when I couldn’t find anyone to make repairs anymore I got my first Bernia 730 artista and loved it. this past year I have upgraded to the 765SE and am so excited to have the larger sewing space and the larger hoop which I will be getting from my shop, The Sewing Palace Bernia in Helena MT, for my birthday present to myself. I love all the old machines you showed above. History is so important to know where you are going. Singer was the first machine I ever used, but the first one I purchased for myself is my Bernina 220. My mom also gave me a Montgomery Ward machine when I left home and that was a heavy beast. I love my 220 and I take it on tour when I travel with my son’s drum and bugle corps, repairing and altering 150 uniforms and costumes. Thank you, Bernina, for making such a great machine. Though I had sewn with other machines, the first one that was really mine was a Bernina 1000 Designer. It’s a great machine, and I still own it! I purchased my first Bernina 830 in 1976. I went on to an 1130 -still my most favorite machine but I wore it out, the presser foot lost it’s grip but I still have the machine. I acquired a 1630 and currently a virtuosa 153. I learned to quilt on my 830 and continue to quilt and sew garments today. Sewing on one of my Bernina’s makes me Happy! My first machine was a White zigzag in 1960. My parents bought it for me right after I married. 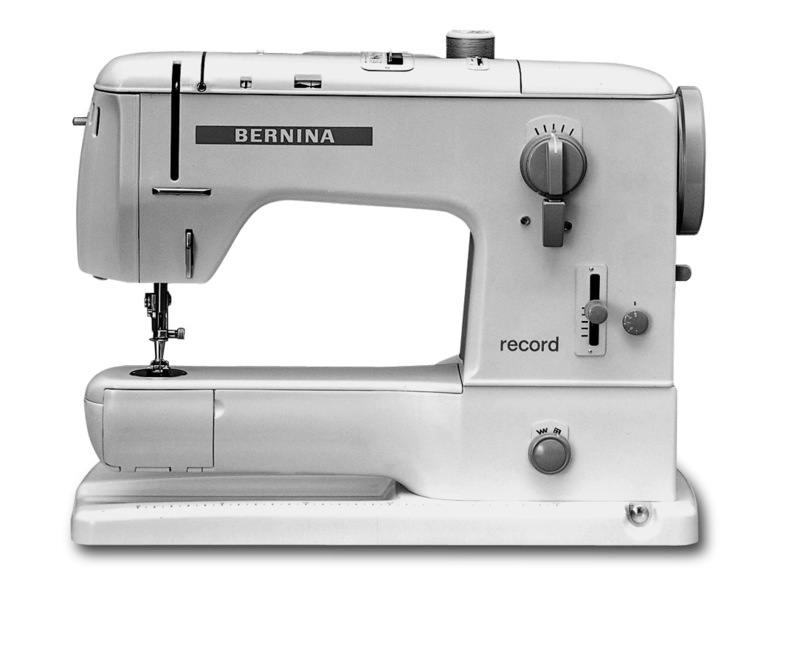 For our 25th anniversary, I received a Bernina 930Record , which had superb stitch quality. In 1997 I purchased my 1630 which is still a dream machine(kept my 930). Love these machines. I was given a singer when I was a teenager, but I bought a kenmore from Sears. When I started quilting , saved my money and bought my first Bernina, a Activia 125. That was about 19 years ago. I still sew with that same machine, and it still sews very well. Love my Bernina. They spoil you , makes you only want to buy Bernina’s. My first sewing machine was my grandmother’s old backup Singer. As none of her daughters sewed, she was so happy to finally have someone to pass it down to. She came over to help me with my first project– one of those 1980’s Western skirts with the ruffles for my home ec class in high school– but I had already finished it. She was so proud. I used that for decades. I finally bought my brand-new Bernina I’d always wanted last year. The first sewing machine I used and learned to sew on was my grandmothers Singer, which was not electric. You had to peddle with your feet. I had the sewing machine restored however there are parts missing and it is not usable. I learned to sew on my mother’s Singer Featherweight around 1950. I had a variety of machines over the years. I’ve been sewing on a Bernina for about 5 years. It was 1981. I took my first quilting class, using a new invention… the rotary cutter. My old singer, well, it just was awful. Everyone told me about BERNINA, so the next day I took the trip to a BERNINA dealer and purchased my first 930. It was heaven. No problems at all, the straight stitch was perfect, tension was perfect. I just adored it. Of course, a year later, I got the 1130, and then the 1230, and then the 1530 and then the 1630 and then the 170, and then the 200 and then the 830 and today….. the 780. Along with a BERNINA serger, a Q20, a 550 and an 801 Sport. Yes, I adore each BERNINA. Thank you so much for the hours of absolute pleasure you have given me. No matter what else is going on, I know I can count on my BERNINA to make me happy. My fist one was a Singer that had disks for decorative stitches. My first sewing machine was a toy one that I received for Christmas when I was seven years old back in 1972. I was so excited, however, It broke that same day and then I was really sad. The next year for Christmas I received another toy sewing machine and I was really happy. However, this one broke the same day too. So, Christmas morning in 1973 when I was eight years old my mom handed me a sewing book and told me I could use her old Singer machine. I’ve been happily sewing since! My mom bought me a Singer when I was a junior in high school. She was a big sewer and assumed I was too! The only thing I ever learned to sew was halter tops and I wasn’t very good at that! I didn’t sew again for about 25 years and I bought a Bernina 150 QE. It’s still going strong! I now have 3 sewing machines and a serger. My first machine was a Singer 201-2 from 1938 and it was and still is it’s handsome Queen Anne cabinet with matching stool. My first Bernina was and is a 1010, the Swiss Anniversary edition and I still have that too. Since then it’s moved to my lake house along with my Bernina B580. At my main house the big dog is my B790. Once you go with Bernina, there is no looking back! I began sewing at the age of six on my mothers’ old Singer. I have used a number of different brands over 50+ years but my machine of choice these days is my beloved Bernina. I don’t ever want to sew on anything else. In the early 70’s My former Mother-in-Law gave me her Singer which I used for many years. I was fortunate several years ago to purchase a very lightly used Bernina 153 & my love affair with Bernina begin. Last year purchased my dream machine – the 770QE, love everything about this machine! This year, wanting a smaller machine for basic piecing and classes – purchased the I love sewing – Cotton and Steel 350, more Bernina love! Feel extremely blessed and spoiled! learned on a Singer, now Bernina all the way. My first sewing machine was a Singer. It broke about 20 years ago. I haven’t been sewing since then and this year I purchased a Bernina 350PE to replace it. I recently retired and plan to start sewing again. My first machine was Singer converted to electricity. I bought it in a sewing machine shop in Ft. Lauderdale, FL to take to college so I could make my own clothing, I still have that machine today. But along the way I have added to my room a Bernina 560 and a Bernina 830..These two machines I can not live without…. they have taken my sewing skills to a new level even after all these years (60) of sewing.. Thank you Bernina for making such a wonderful product. I started sewing at my grandmother’s house in her treadle machine. It sewed straight stitches only and I don’t think it even had a reverse stitch. The threads constantly broke, but it didn’t slow my enthusiasm. I love my Bernina 430 and thinking back on that first machine I have even more appreciation for my Bernina! I started sewing with my mom’s Montgomery Ward straight stitch machine. It worked. Instead of the traditional pearl necklace for a wedding gift from my new husband, he bought me a White sewing machine. Oh the things it could do – what a wonder. By the early 70’s I graduated to the latest Elna – what a marvel and boy could I sew. My poor Elna died a slow death, and that is when I discovered Bernina. Started with the newest innovation of the 200. Now I was really sewing. Now a year ago, I bought the 790. The things this newest machine can do – WOW!!!. So glad I found Bernina. My first machine was a Kenmore. i got it as a wedding present from my parents. It lasted a long time. I now have a 820 Bernina and I love it!!!! My first sewing machine was toy that did a single thread chain stitch. The first machine I got myself was a used Singer that I made most of my clothes on for several years in my 20s. I traded it for another used Singer so I could have zigzag capability. And I finally was able to buy a brand new Bernina 1130 which has been a true workhorse, doing everything I asked of it. Until it got sick in the midst of sewing my granddaughter’s Prom outfit and I’m waiting for the verdict on its illness. My first sewing machine was an older model Singer that my mother-in-law got at a garage sale for $15!!! It sewed well but I wanted more features and with every new machine I got more of them. My first Bernina was a 580 which I still have and love…and I also have the 780 for size but the 580 is the one I travel with the most. And now that I also have a Bernina serger (1300)…i guess I can now say I’m a Bernina gal! Singer was the first machine I bought, that was back in 1988. In 1994 I bought my first Bernina, the 1630. I was filled with emotion when I stitched out a perfect buttonhole. Forward to present, I now sew on the 830E, 780, and 1300 serger. A collection of vintage Bernina sewing machines have also come into my life. I started out on a Singer Treadle machine, I was the oldest of 10 children and my mom taught me to sew, but didn’t have time to teach any of my siblings. So most anything that had to do with sewing, I took care of. I got my first Bernina around 30 years ago and have had 2 to 3 of them in the house at all times since. My very first sewing machine was my grandmother’s Singer Featherweight but one of my good friends in high school had a Bernina! I was so envious of all the special stitches it could do! When I finally bought my first machine it was a Bernina 1630 – felt like driving a BMW when I got it – so fast and beautiful stitch quality! My own first sewing machine was a graduation gift but that was not the first machine I used. I learned to sew on my grandmother’s machine. It originally was a treadle machine; my grandfather electrified it. My 560E is my second Bernina. My first is an 1130 that is still working. My first sewing machine was a toy and I was about 8 or 9 years old. It didn’t work very well but my grandmother introduced me to “hand sewing” and I always credit her for my patience! My first “real” sewing machine was a Necchio (not sure of spelling) that I won at the New York State Fair. My first sewing machine was my high school graduation present from my mom 35 years ago. When I bought my Bernina B880 last year, I gave it back to my mom to use. I told her she can’t get rid of it though as it’s very sentimental to me. It still sews beautifully. I learned to sew on my mom’s 1948 Singer. My first sewing machine of my very own was a Nelco purchased for me at the State Fair of Texas in 1965 by my grandmother when I was twelve. I sewed clothing for myself throughout junior high and high school and made wild-print bell bottom pants for teenage male clients. Then I took it to college with me. My “beautifully sewn” wardrobe included red hot pants with coordinating red damask maxi vest. I added a used Slant needle Singer as a young married, then wore out an Elna before I finally purchased a Bernina Artista 165, upgraded to 180. What a difference it made. I gave it to my mother when I purchased my beloved Bernina Artista 730. It sews, quilts, and embroiders beautifully. My first sewing machine was my grandmother’s featherweight which she bought while pregnant with my mom. I learned to sew at a young age on my mother’s machine. After her passing, my dad bought me a portable sewing machine that I could take to college. I used that machine for over 20 years until I traded up to my first Bernina 1130, which I still have. She sits proudly beside her new B790 sister. I love them both. My mother was not only an avid quilter but sewer as well. Growing up she made all of our clothes, was the manager of a fabric store and later opened her own quilt shop. Therefore sewing became a part of my life as she taught me not just the basics but all her little tricks of the trade. She had one of the original Singer Electronic machines, but my truly first sewing machine that I bought myself was a Bernina Artista. I use it for everything, but the its the special things I make as gifts for family, friends and donations that are most special. Please enter me in the contest, thank you. The first machine I actually owned was a Bernette that my husband bought for me one of our first Christmas’s together. It still runs like a champ and is one of 3 that I now own. I have a Bernina 580 that I take to classes and retreats and my 830 that mostly stays home. My grandmother gave me her old Kenmore in the early 70’s. Got my first Bernina in the early 2000’s and haven’t looked back since – upgraded to a B580 a couple of years ago – have them both up and running all the time! My mother always sewed so I didn’t until I was married and had children. But I first sewed in home economics what a drag what I really learned was how to un-sew☹️ My mother had an necci my first machine was a singer with the disks, then a singer with dials. Then an singer 2000 Athena which I still have. But my love is an Artitsa 165 which I purchased used from my local quilt shop which is wonderful. Then I purchased an Pfaff Creative Sensation because of the price difference from the Bernina I really wanted. Wish I had waited. 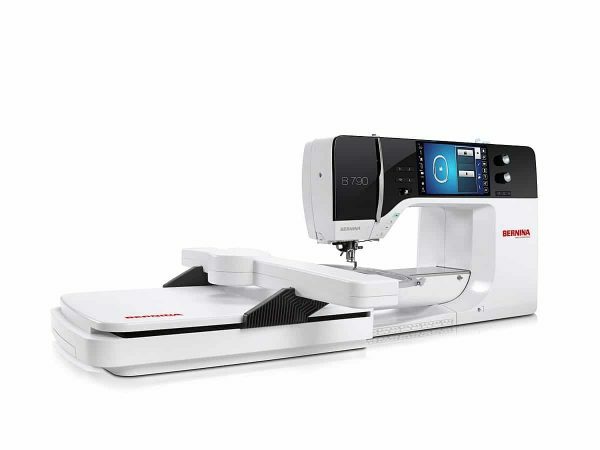 Now my desire is the Bernina 790. My first sewing machine was my mother’s New Home. It was used when she bought it in 1950, but it lasted, with heavy use, well into the 60’s when it was replaced with a Singer. I had a used machine of my own in college and finally bought a Bernina 830 in 1981. I still love this machine! It is the best. My first sewing machine was a very old Singer that I bought from a second-hand shop in 1968 or 1969. It was a dream, even though it only did a straight stitch. My first Bernina came a long time later, in 1999! I now have a 630 and a 780 and love them both. I surely do remember each of my sewing machines. They have brought me much joy. I learned to sew on my Mother’s 1946 White machine. In 1960 I won a New Home zig zag machine and made many clothes for dolls and myself as well as stuffed animals. In 1982 I got a Montgomery Ward machine that had many designer stitches. In 2001 I got an HQV Designer 1 to have embroidery capability and last year, I bought a Bernina 770 QE for quilting and I have a ruler foot and rulers to help with that, now all I need is practice! I learned to sew on my mother’s Singer, but the first machine I purchased was a Bernina 1230 – it was a dream. Now I have the amazing 880 but would never part with my trusty 1230 and still use it occasionally. My husband bought me my first sewing machine a 830, then after retiring I purchased a 350, but had to spoil myself for my 60th 🎂 Birthday with a 790. Love all my lovely machines 💛. My first was a singer she was my only for thirty years,her demise was sudden and irreversible. After months of research Bernina 580 was her successor and I couldn’t be happier. My first Bernina was purchased with a small inheritance from my Daddy. It was a 1630. My Mother had a 1130 and she was so happy with her machine I just had to have my own Bernina. She still owns that 1130 along with the Artista 180. I currently own the Artista 180 with embroidery module as well as the 750QE which I received from my husband as an early retirement present!!! I’m a confirmed Bernina owner following my Mother’s footsteps!!!! 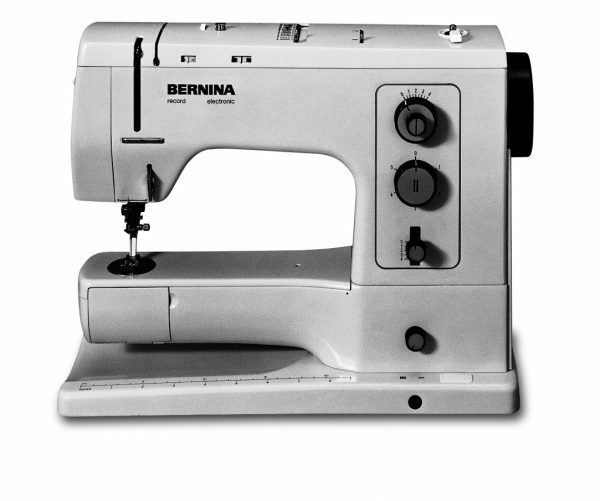 My first sewing machine was the Bernina 830 which my husband bought me for our wedding anniversary. When, decades later, its “namesake” — the new 830 — appeared, I bought it. The husband is gone (may he rest in peace), but the two 830s remain, reliable and easy to use. I still love them. My first sewing machine was a Singer zigzag machine which I bought at a thrift store while in college. Upon my mother’s death however I inherited her machines which were by Elna and Bernini. My first sewing machine was a Bernina that my mom received for a wedding gift. I made a skirt for 4-H when I was 8. I then went on to make several dresses. I hated sewing after that…but I just recently started quilting and love it! Now my daughter and I do quilting. She is taking creative clothing and quilting in 4-H and she is using my Janome that I recently purchased. My first sewing machine was a Singer Tradition. I have a fondness for it and cannot part with it, but it no longer performs the way I would like my machine to. I learned to sew on my mom’s Singer machine. Sewed on that until she purchased the Bernina ‘workhorse’, 800 series. I hope that one day I’ll inherit it! I’m also hoping to inherit the Singer treadle machine that my Grandmother used. In my twenties I saved enough to buy my own Bernina, a 1010. It’s a great machine! Now that I’m retired…I see a lot more time for sewing! Time to celebrate! I learned to sew on my mother’s Singer and when I got married in 1975 my grandmother bought me a Bernina. I have always kept this machine but have purchased a Bernina 770QE. I began sewing when I was 8. My mother helped me make a pair of pedal pushers. I knew that I would continue to sew all my life. I am now in my 60’s and sew something almost every week. My first sewing machine was a New Home my father bought for my mom from a traveling salesman. Since then I have had several machines over the years and seven of them were Bernina’s. I have two Bernina sergers and two sewing machines the 730 and a 880. I am very luck! My first machine I received when I was about 11 – a pink Sears straight stitch only machine. I begged for a Bernina for my 16th birthday and got it. I still have it and use it 42 years later! It’s a great machine. My first sewing machine was given to me by my mother. It was a JC Penny machine, and cost $100, back in 1979. It was a huge gift, and the only thing I got for Christmas that year. I was so excited and happy that I cried, but my mother thought I cried because I was disappointed. That was the best gift I ever got! Now sewing is my life! I got my first Bernina in 1989. It was a B 1030. I traded up to get a B 230, because I had to have the blanket stitch. Now I get to work at a Bernina store! I’m the assistant sewing machine tech, plus I get to work upstairs with the customers and fabric. It’s a dream job! I currently own 3 Bernina machines. My first sewing experience was at age 4 when my great-aunt taught me to handsew lace onto my gloves and ankle socks for church. My first machine experience was on my Mom’s 1949 Singer straight stitch and sewed on it until I bought my first machine in 1976 when I graduated from college. Fast forward to 1982, I purchased my first Bernina, a 930! That machine allowed me start a career as a quilt artist and still serves me well today. Last year Hanspeter visited Chattanooga, TN and I asked him to autograph my foot control! A few years later, I purchased an 801 portable as I was teaching quilting throughout New England and needed a travel machine. Additionally, I purchased a Bernette 334D serger which came in very handy as my daughter was a dancer and there were many costumes to be made! In 2005 I purchased a 730 and fell in love with the computer designs. I am blessed to have a dedicated sewing studio in my home with my 930 and 730 set up and lots of room to lay out fabrics, etc. I will be retiring in 4 years and will upgrade my 730 to whatever Bernina catches my fancy!! Love my Bernina! recommend Bernina to anyone who asks. They can’t be beat IMO. My first sewing machine was a Singer Featherweight for highschool graduation. Next came family so needed something bigger. Graduated to a Kenmore. Several years later I finally got smart and bought a Bernina 930; then a 180; then a 730; then a Bernina serger; then my latest – the 790, which I dearly love. All machines are still in use with either myself or my daughters. At 78 this may be my last machine – but I’m not promising. I left a comment above but forgot to mention that I only received this post on June 20 and since this contest was already over I guess I don’t have a chance at winning the prize. Thank you anyway. As far as I am concerned there is no other sewing machine. I brought my first Bernina , a 830 in 1973 and we’re still using it. Then came the 1230 which I sold to buy the 1630, which I sold to buy the Artista 180, and then added the new 830. They keep getting better and better. I would never buy anything but a BERNINA! Do I remember my first sewing machine…. haha….. YES, I still have it. An Elna Supermatic from 1956….. I was 8 years old. My first Bernina was an Artista 180…. I have that one too, along with a 530 and an 830LE and a couple of Bernina sergers. I’ve always had trouble getting rid of ‘old-friend-sewing-machines’…. IF I bonded with it, it lives with me for life…… if it was ‘trouble’ then it went away when I purchased a new machine. My first machine was a Kenmore but thankfully I had a chance to buy a used 830 for $50 in the early 1980’s. It still runs beautifully. Currently using an Artista 180. Great machines and they last forever. My first sewing machine was a Singer that I inherited from my mother. I still have it for sentimental reasons. The few sewing machine I bought for myself was a Bernina Sport. And I still have it because it works just fine. My first sewing machine was a Singer Touch and Sew. It had the bobbin that you could screw open to remove the thread if you needed to change the color. I made so many fabulous things from clothes to costumes to curtains. I am now sewing with a wonderful Bernina that I enjoy immensely. I still sew just about anything and love how meditative it is to immerse yourself in a project. My first sewing machine was a used Sewcraft machine! Thanks for the nice article! My first sewing machine was a gift from my grandfather. After years of sewing with it (clothes, jackets, curtains, lingerie) I stopped sewing because the machine would eat the fabric. After years of wanting a BERNINA, I finally purchased my first BERNINA. It was a simple model and after my 2nd guide class, I traded it in for the 440QE, then the 640, then the 830LE and now the 880. For travel, I use the 430 and have an 807 and 1031 as well as the 1150MDA. Nothing sews like my BERNINAs. Thank you for the history and thank you for the finest machines/computers that I enjoy sewing! I purchased a Kenmore sewing machine in 1967 and it is still my go-to sewing machine, though I did purchase a new machine a few years ago that provides more specialty stitches.